I’m never sure what to write on these “About” pages, but here goes. Hopefully you find it interesting. 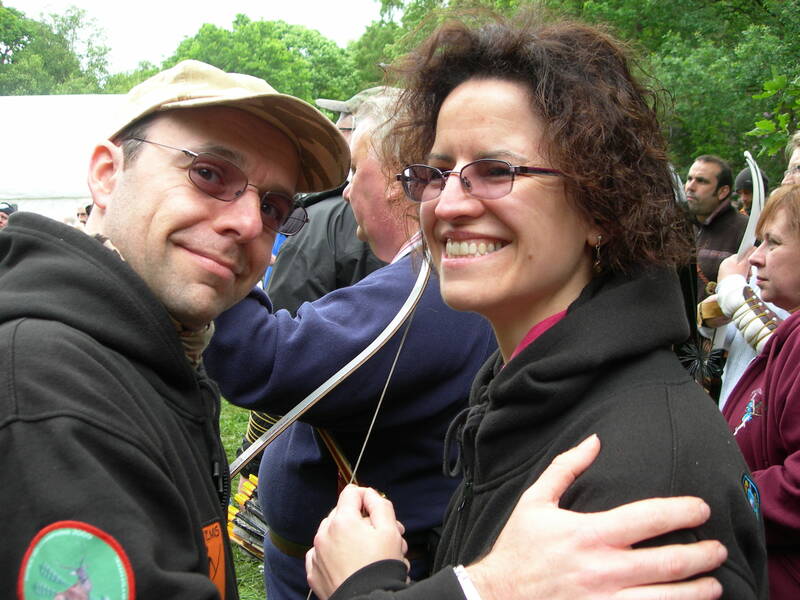 Sharon and I got into archery over 9 years ago, after trying it out in Cornwall whilst on holiday. Since then my better half (Sharon, she is the pretty one on the right in the photograph below) and I have been to countless shoots round the country and more than a few Championships. Oh yes I’m Rob (the not so pretty one on the left). When possible I also like to try and help other archers, via tips and advice on this site or coaching. Here is a far better one of Sharon without her famous shoot like a girl t-shirt. Many of us do try and keep up with her. 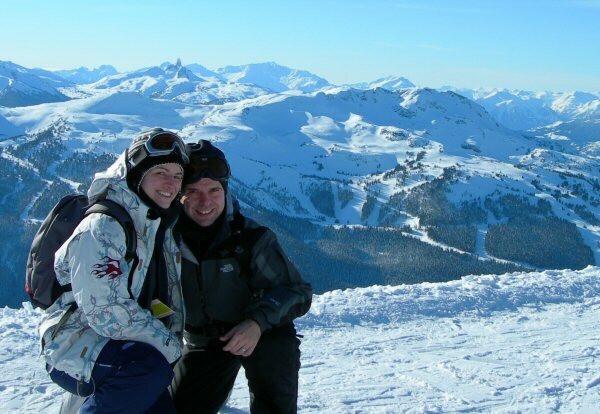 Other than flinging arrows round woodland, we both enjoy skiing, when funds and time allow. Any question or comments drop me a line. I also have an Instagram and Tumblr site, where I publish images and additional thoughts. Hi there Rob and Sharon, just found your blog, don’t know how, or if i’m going to be able to find it again ! !, anyhow, thank you both I have my first open shoot tomorrow, sunday 23rd June, at Magic Dragon Archer’s, Kent. I’ve been shooting for a year now and I am looking forward to shooting in the woods, at would be (real ish) animal targets, your pics and shoot reports have been of great help, thanks again, best regards, Mark. Thanks for the comments Mark, hope your first shoot went well. Sunday was a bit wet for us. Hi Rob and Sharon, well the weather report for our area on Sunday was also wet, but we only had about 8 seconds of spitting, dreadful !. The day went very well indeed, I arrived at 08:50, a bit nervous as the car park was filling up, people, bows and arrows everywhere, then I noticed a fellow club member, and then another two, we got booked in, tea, egg and bacon rolls, the catering was great all day long. We got started at about 10:00, there were 5 in our group, 4 hunting tackle and 1 shooting barebow, my class was H/T, the woods were excellent and the targets a real challenge, left and right pegs, I started on the right peg and then onto the left for the 2nd session, no cut backs or too much clearing of brush or undergrowth, so very realistic, 1st session I scored 284, and 2nd session 316, so 600 total, 3 x 24s, very happy, I think there were 90 archers in all. Special thanks to Bruce (my instructor) and Penny, of White Horse Archery, Dave, Darren, Charlie, and Clive also of WHA, and Steve who was in our shooting group, the course makers, caterers, Marshalls, and of course the organisers of Magic Dragon Archers, hosts of the shoot, what a great day, looking forward to September 29th when it all happens again, still smiling, regards Mark. Sounds like you had a great day and less wet than ours. Glad you had a good day, good score too and no doubt this will be the first of many shoots for you. Really enjoyed the blog. I was a member of TF@RA many years ago and am always looking for news of that great club. I look forward to reading your future postings. HI Sam, Glad you like the blog and thanks for the positive comments.